There are few combinations out there that make me happier than the classic trinity of tomatoes, basil, and mozzarella. And as tomatoes come into season, I am positively giddy thinking about all the possibilities. Its really hard not to just eat them sliced and sprinkled with a little salt, but when I have things like this salad to make, I resist. The night I made this salad I had initially planned a caprese salad with a side of bread, but then I thought about how much I love panzanella, and decided to mix things up. 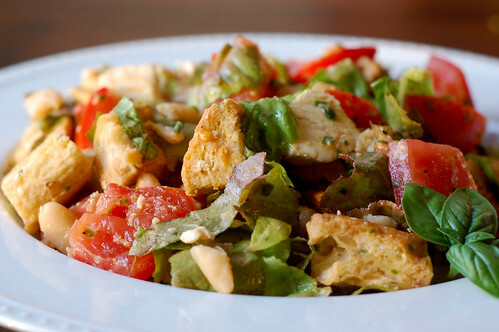 Panzanella is so easy and versatile, and it makes the perfect one-dish meal. Protein, veg, and carb, all in one bowl. I used white beans in mine, but I think grilled chicken or shrimp would work wonderfully as well. This is a perfect summertime meal, and it was thoroughly enjoyed with a glass of chilled white wine. Preheat the oven to 300. Spread the bread cubes in a single layer on a baking sheet, and cook 10-15 minutes, or until the bread is crispy but not browned. Remove from oven and allow to cool. Alternatively, allow to sit out for several hours or overnight to stale. Add the olive oil, white wine vinegar, and lemon juice to the pesto and whisk to combine. Set aside. In a large bowl, combine the tomatoes, white beans, pine nuts, lettuce, basil, mozzarella, balsamic vinegar, and bread cubes. Toss with dressing to combine. Serve immediately. I'm a sucker for anything caprese as well. It just screams summer to me. This looks like a fantastic one-dish meal! I will definitely be making it this summer. Perfect timing- I had vague idea for a caprese panzanella with grilled shrimp for dinner this week, but hadn't really thought it completely through. This is just what I was thinking! Who ever first found the combination was and is a genius! This is gorgeous. I have a cookout this weekend and was thinking pasta salad but now I'm thinking this one!